Edgar Mitchell, 85, one of 12 men to have walked on the moon, died in Lake Worth, Florida on February 4, 2016. Mitchell was born on September 17, 1930, in Hereford, Texas. He considered his hometown Artesia, New Mexico (near Roswell). 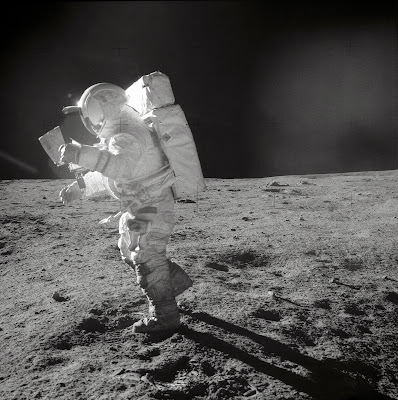 Edgar Mitchell on the moon. Mitchell stepped on the moon twice, on February 5 and 6, 1971. Mitchell spent 33 hours on the moon. The Apollo 14 mission was from January 31 through February 9, 1971. Therefore, he died during on the 45th anniversary of his trip to the moon. 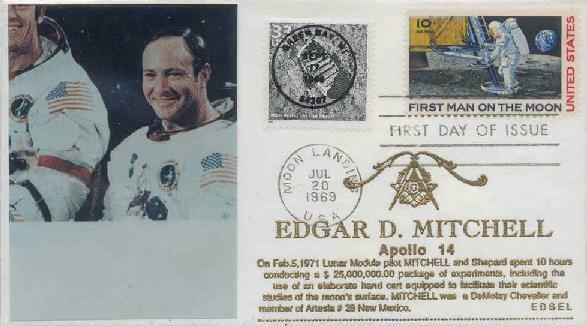 Astronaut Mitchell's Apollo mission involvement was memorialized in the Hall of Fame of DeMolay International, part of the Masonic Fraternity. Mitchell was a member of Artesia Lodge #29 in New Mexico. After his Apollo success, Mitchell was involved in several projects, some with the Institute of Noetic Sciences, involving the unexplained, paranormal, and human consciousness topics, including UFOs. 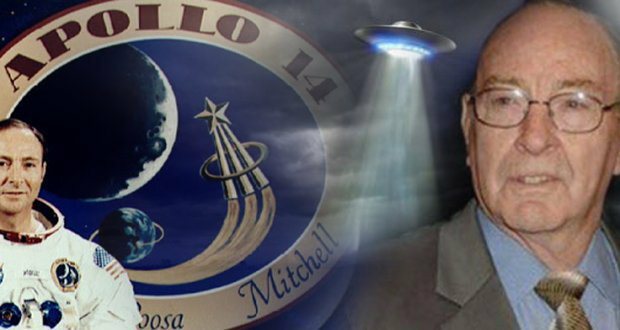 Mitchell has publicly expressed his opinions that he is "90 percent sure that many of the thousands of unidentified flying objects, or UFOs, recorded since the 1940s, belong to visitors from other planets". Dateline NBC conducted an interview with Mitchell on April 19, 1996, during which he discussed meeting with officials from three countries who claimed to have had personal encounters with extraterrestrials. He offered his opinion that the evidence for such "alien" contact was "very strong" and "classified" by governments, who were covering up visitations and the existence of alien beings' bodies in places such as Roswell, New Mexico. He further claimed that UFOs had provided "sonic engineering secrets" that were helpful to the U.S. government. Mitchell's book, The Way of the Explorer, discusses his journey into mysticism and space. In 2004, he told the St. Petersburg Times that a "cabal of insiders" in the U.S. government were studying recovered alien bodies, and that this group had stopped briefing U.S. Presidents after John F. Kennedy. He said, "We all know that UFOs are real; now the question is where they come from." On July 23, 2008, Edgar Mitchell was interviewed on Kerrang Radio by Nick Margerrison. 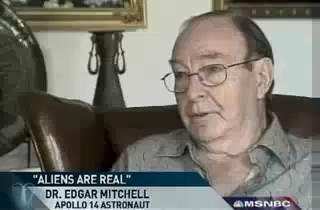 Mitchell claimed the Roswell crash was real and that aliens have contacted humans several times, but that governments have hidden the truth for 60 years, stating: "I happen to have been privileged enough to be in on the fact that we've been visited on this planet, and the UFO phenomenon is real." In reply, a spokesman for NASA stated: "NASA does not track UFOs. NASA is not involved in any sort of cover-up about alien life on this planet or anywhere in the universe. Dr Mitchell is a great American, but we do not share his opinions on this issue." 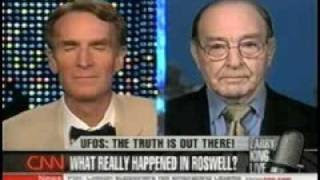 In an interview with Fox News on July 25, 2008, Mitchell clarified that his comments did not involve NASA, but quoted unnamed sources, since deceased, at Roswell who confided to him that the Roswell incident did involve an alien craft. Mitchell also claims to have subsequently received confirmation from an unnamed intelligence officer at the Pentagon. In an interview for AskMen published March 6, 2014, Mitchell said that he had never seen a UFO, that no one had ever threatened him over his claims regarding UFOs, and that any statements about the covering up of UFOs being a worldwide cabal was "just speculation on my part." In 2015, Mitchell made what Huffington Post U.K. characterized as "the astonishing claim that it was aliens, not diplomacy, which prevented the Cold War from descending into the Third World War." In a Mirror Online interview, Mitchell said "White Sands was a testing ground for atomic weapons – and that's what the extraterrestrials were interested in. They wanted to know about our military capabilities. My own experience talking to people has made it clear the ETs had been attempting to keep us from going to war and help create peace on Earth...."
Edgar Mitchell appeared in the documentaries In the Shadow of the Moon, The Phoenix Lights...We Are Not Alone, and The Living Matrix. Source. Intriguingly, Mitchell was interviewed frequently about UFOs when the second X-Files movies appeared in 2008. Mitchel, also, told Bloomberg Business that the 1947 Roswell incident, which to some people is evidence of an extraterrestrial crash landing, was covered up. "It's not just military. It's a cabal of organizations primarily for a profit motive," he told the publication. However, he drew the line when it came to an interview with the UK tabloid Mirror. The newspaper claimed Mitchell said UFOs had helped prevent nuclear war. "None of those statements were originated by me," he told the Huffington Post. In addition to Mitchell's UFO thoughts, it became known after Apollo that he had conducted ESP experiments on the mission. He was also a believer in extraterrestrial activity, and was convinced UFOs had visited Earth. Edgar Mitchell was in the small fraternity of 12 men who had walked on the moon. As of his death, now seven survive: Buzz Aldrin, Alan Bean, David Scott, John W. Young, Charles Duke, Eugene Cernan and Harrison Schmitt. A mason who spent 33 hours/degrees on ' the moon '. Shucks, and we 21st century guys just can't get out of near-space orbit. Also on 04.02.2016, Maurice White, founding member of soul/funk group Earth,Wind and Fire, died at the age of 75. He wrote, "Shining Star" and "Keep Your Head to the Skies" among many others.